So one of our projects for this winter was to look at some boats. We have been living on our current boat (Quantum Leap, a 1985 Chris Craft) during the beautiful Rhode Island summers on Narragansett Bay. We are considering replacing her with something a little newer (say, maybe less than 15 years old?) and a little more appropriate (a few more creature comforts) for the liveaboard cruising lifestyle. 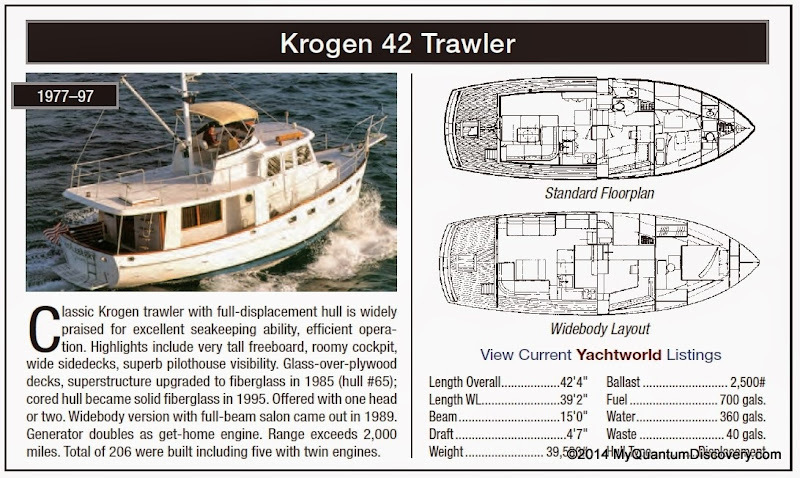 In a perfect world (well, at least our world) our boat of choice would probably be along the lines of a Kady Krogen or Nordhavn “trawler”. Those two are “true” trawlers in that they have full displacement hulls (like a sailboat) and are extremely economical to run with their small but reliable engines. They are also very slow with top speed being “hull” speed of 7 or 8 knots (~10 miles per hour), or only about as fast as a similar sized sailboat. Due to the small engine/slow speed design, miles per gallon could be as high as 7 or 8 (rare) – almost as good as an RV! Many of the true trawlers are a “raised pilothouse” design which makes for better visibility from the inside helm and adds more interior space below as well. These boats are of ocean crossing quality with extremely long ranges and many have “stabilizers” to keep them from rolling excessively in a beam sea. Alas, these boats are also for the most part way out of our price range. That is unless they are fairly old (80’s vintage), which isn’t always bad, but among many other things, older boats of the “trawler” design tend to have a LOT of exterior wood and that is a maintenance nightmare. Why not a sailboat? Yes they are also economical, but fall way short in the accommodation area. In addition it takes a lot more effort to operate a sailboat – at least at our age! The helm is almost always out in the weather (yuk), plus you are always banging your head on something. Not to mention you always have to wait at the bridges! We have owned sailboats and in a storm would always favor a sailboat with its tons of weight below the waterline and self righting tendency. But even as former sailors our preferences have evolved. Remember the stages of life of a sailor? Sailboat→Powerboat→Motorhome→Nursing Home. Well we are in the stage where power is the preference. And after all we are only going to be crossing bays, not oceans! Anyway we had hooked up with a very accommodating, responsive and helpful broker, Jordan Preusz of Dennison Yacht Brokers. Jordan was kind enough to arrange the showing of several boats in the Ft. Lauderdale area all in one day. If you are ever in need of a boat, definitely give Jordan a call, no matter where you are located! First up was a 2006 Mainship 43 with a rear cockpit. Nice boat! Big! Length over all (LOA) was almost 48′ which would be the limit for us regarding slip space at our yacht club (and would require that we get on a list for a different slip). 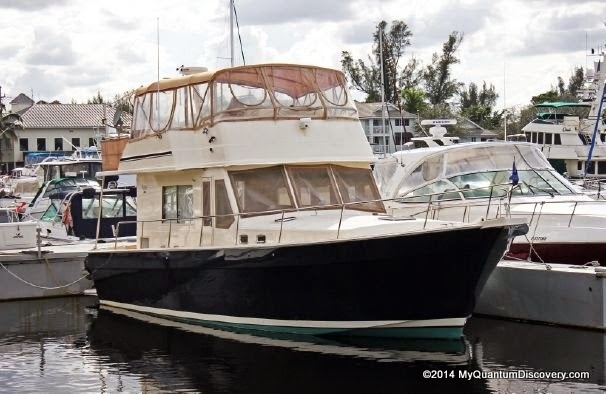 Very roomy salon, wide deep walkarounds, easy stairway to the enormous bridge with full summer galley, nice easy to access engine room, very smooth running engines, separate (and large) washer dryer, real oven, large separate fridge and freezer. Downsides were only one head, a not so great guest cabin, a semi-displacement hull and two big honkin’ fuel sucking 540hp Cummins engines. Nothing wrong with Cummins, just the massive fuel burn. Turned out this boat sold a few days after we looked at it. Next up was a 2000 something Carver, don’t remember exactly because this boat was pretty well trashed and neglected. Plus it was really beat up from the Florida sun. We didn’t like the layout that much and couldn’t even get into the engine room. Next! 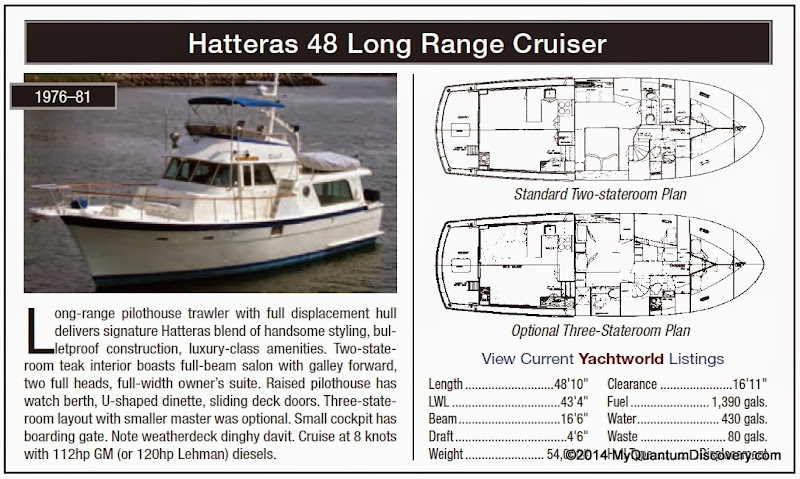 A 1980 Hatteras LRC (Long Range Cruiser) was next. Wow, what an awesome boat! Stored in a covered slip (that’s a big deal in FL) this boat was huge, so much freeboard we had trouble getting aboard and while it was listed as 48′ in length the LOA looked way bigger than that. So, you may be wondering why are we looking at a 1980’s boat when we wanted something newer than our current boat, not older. Well, this is a very good example of the “they don’t build em like they used to” cliche. Hatteras is still in business today (and many other boat builders are not) and has a great rep for building quality boats. The LRC is a true trawler with small engines (2@112hp non turbo), stabilizers and an 8 knot cruising speed. At 27 tons, with a 16.5 foot beam and 5′ draft this thing is a tank. With about a 2 mpg fuel burn, the 1370 gallon fuel tank (no kidding!) makes it capable of crossing oceans (and draining bank accounts, but that much fuel would last us for years!). In addition, the LRC has very little exterior wood considering its vintage. On the downside, there aren’t many of these quality boats around and the price reflected that, being way above other boats of this size/age. And alas, it quickly became apparent that this was just way too much boat for us and our rather modest goals. But man, was this a great boat! 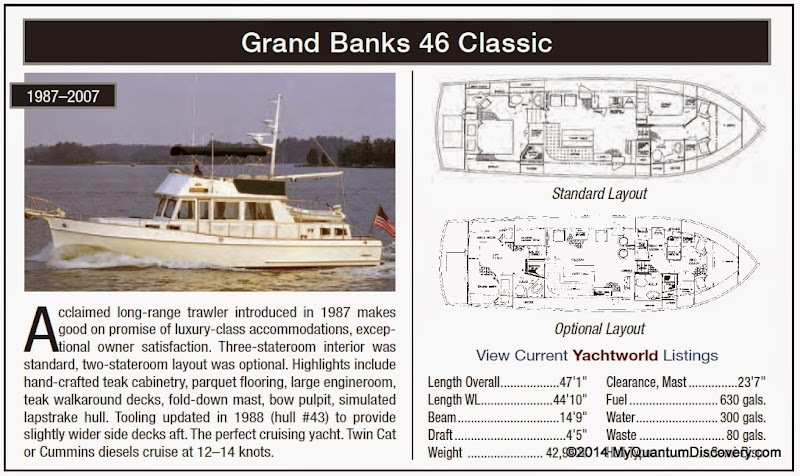 Next up was a 1992 Grand banks Classic 46. Nice boat, the Grand Banks name is very well regarded and built by a respected Chinese boatyard (as are many quality boats these days), but after the Hatteras it seemed kinda dumpy. This one needed a lot of work on its wood windows, doors and hatches, plus it had a lot of hours (4000) on the twin Cat 375HP 3208 engines. Oddly it had just come down from Boston to bask in the Florida sun and hopefully get sold more quickly. In conclusion, it was too much money for a boat that needed too much work and would require too much maintenance. 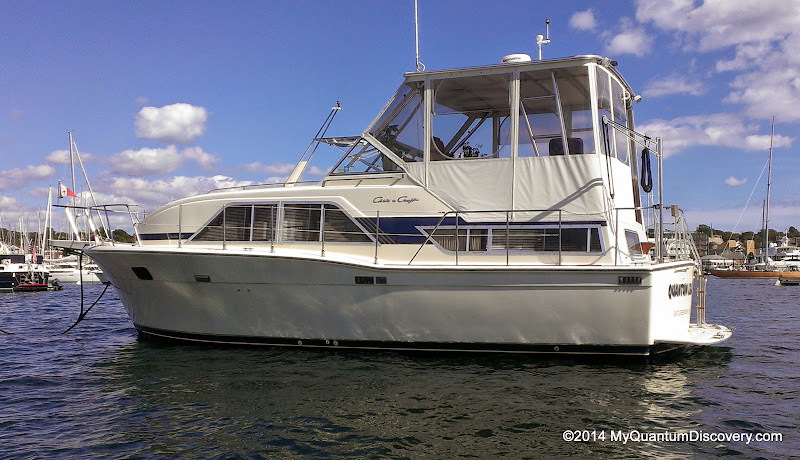 Last boat of the day was a 2002 Mainship 43 Trawler aft cabin layout. 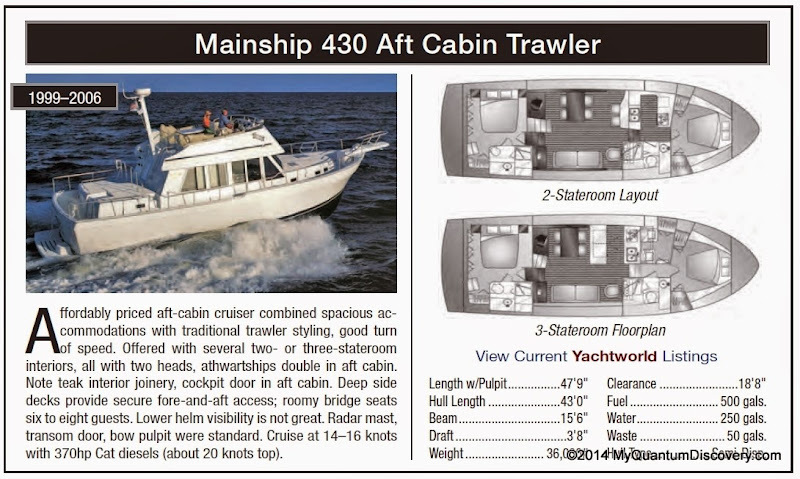 Our current boat is an aft cabin and one of the reasons we are considering something else is all the up/down required for the aft cabin style. Quantum leap has about 6 steps up to climb aboard, 6 steps down from the bridge to the main salon, then 3 more steps down to the cabins – everywhere you go there are steps. Conversely, boats like the 2006 Mainship above have a rear cockpit flush with the main saloon floor so it requires less stair climbing to move around, even though there are 8 steps or so up to the flybridge, there isn’t a lot of climbing required to move from one end of the boat to the other. Nevertheless, we wanted to see the aft cabin Mainship layout as the two lower helm doors that access the side decks would probably not involve much climbing. Well, it wasn’t bad in regard to layout, but another great example of how not to take care of a boat. Yikes! It was docked at a canal house in a kind of spooky neighborhood. Mold was growing on everything and there were lots of cosmetic repairs needed. On the other hand the price was real good! In any case this particular craft was not the boat for us, but we aren’t ruling out a similar boat in better condition. 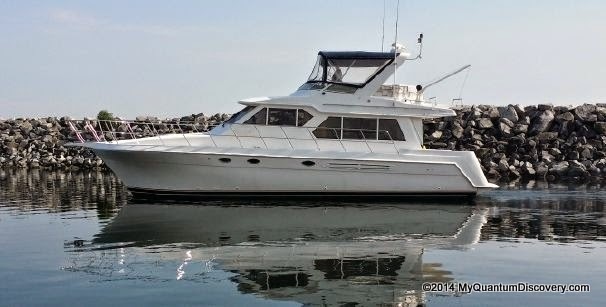 Now, it should be mentioned that back in RI we had an opportunity to look at a 2004 Navigator 44. Well that has become our vessel of choice in most respects so everything we look at is compared to it. Not a trawler, more of a Motor yacht, but with a raised pilothouse, two full queen bed cabins with en-suite full bath, large well laid out salon, inside helm, large bridge deck, huge engine room, moderately sized (318hp) diesel engines giving good fuel economy. And unlike a trawler this boat has a planing hull so can reach higher speeds with lower fuel burn. The downside is less stability in certain sea conditions. There was one Navigator 44 for sale in Annapolis, MD that we had planned to look at on the way south, but it was removed from the market the day we left RI! Hmmm, maybe that’s a sign? In conclusion, it was a fun day and while we didn’t find the boat of our dreams we did have a great time and got to see a lot of layouts and learn a lot about used boats and the used boat market. We even saw some giant iguanas on the docks! So, will we ever find the “right” newer boat for us or will we just decide to keep Quantum Leap? 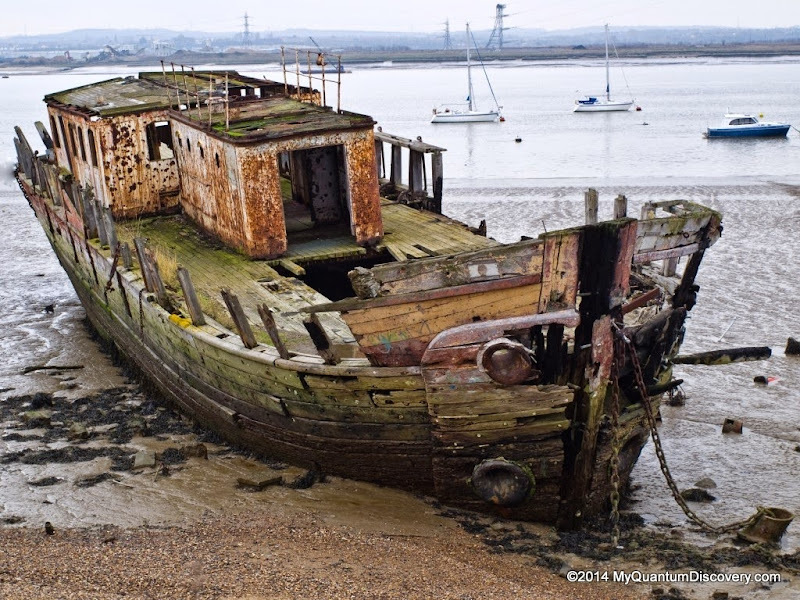 Will we stay in boating at all? Only time will tell so stay tuned! Sounds like it’s even more involved than deciding on a RV! Besides that…. Merry Christmas and a very Happy New year!